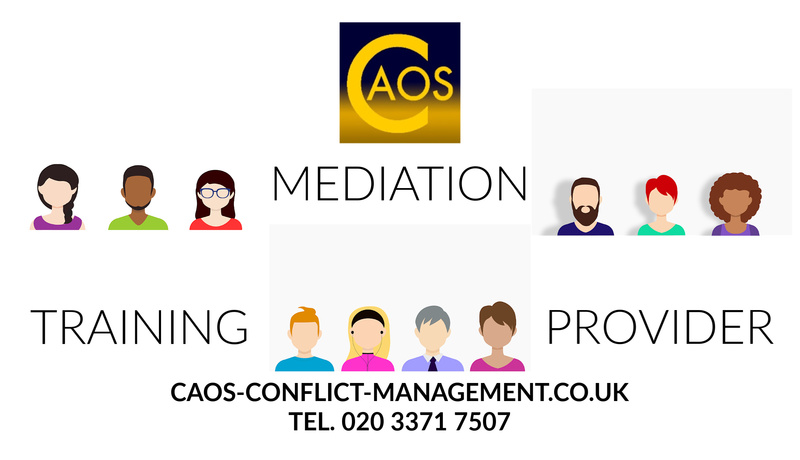 CAOS is a leading mediation training provider based in London. Our trainers are all mediation practitioners and most have more than 15 years of mediation and training experience. Our training is provided at a discounted rate for individuals and charities. We have a strong commitment to training people in the discipline of mediation which we see as a practice which has to be continually developed and improved. Our training course in the CAOS Model of Mediation embeds a reflective practice ethos into the course and the training is provided via an experiential, interactive approach rather than a presentation, lecture and theoretical approach. The CAOS Model of Mediation is a model that can be, and has been provided in any conflict, dispute or relationship breakdown situation. While our mediation service offers the service locally to London and the South-East, our training is available nationally and we have worked in the North-East of England, Scotland, the South-West as well as our locality in the South. If you are looking for a leading mediation training provider for your own training or training for staff in your organisation, please feel free to contact us on the following telephone number or via our enquiry form.